This was my first attempt at this month’s CTC, which is a 10k rate capped at 24spm. The aim was simply to average under 1:50 pace, so I rowed consistently at 1:50.x for the first half, then gradually pulled the average pace down over the second half. A good solid first effort, from which I decided that my ultimate aim by the end of the month was to try to go under 36mins or 1:48.0 average pace. Weights. I have been weight training now as part of my weekly routine for somewhere in the region of 2 to 3 months. I haven’t been doing it often enough to get massive gains from it, probably only averaging once a week. I also started pretty light to get my body used to the new training stimulus before gradually increasing the weight on the different exercises. I am now maxing out with the weight I have on the deadlifts (100kg), so it will soon be time to get some more plates if I want to lift heavier. 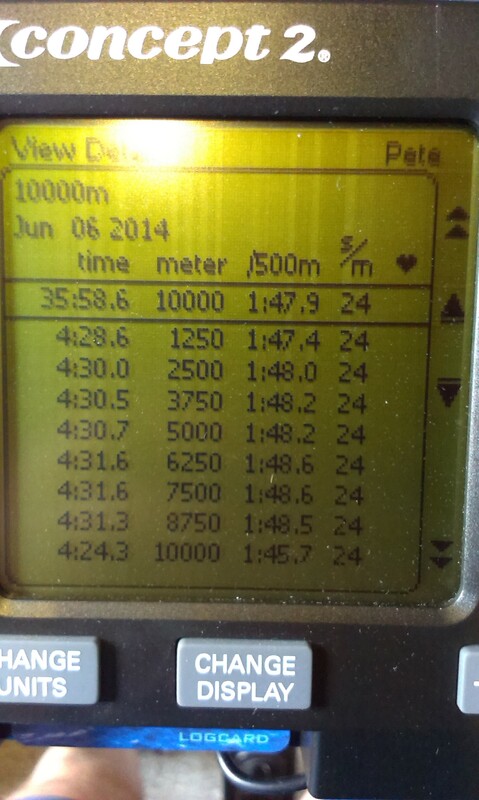 Friday afternoon and I decided it was time for a second go at the 10k r24. This time I would go off at my ultimate target pace and see how long I could sustain it. I had to work hard, as is evident by the gradually slowing splits. But I was just close enough when I entered the final split (of 1250m) to believe that the target was on, and that gave me enough of a boost to push on hard to the end and get under 36mins. It is not many months ago that this was a really hard effort at free rate (27spm+), so things are definitely moving in the right direction. I don’t think I am too far away now from the sub 35mins I want at free rate. Maybe before I go on holiday in a few weeks time I get achieve that goal. So far my recent best is 35:22, compared to an all time pb of 34:22, so I am looking to get back within 2 seconds of pace of my pb on the 10k. Having rowed under 35mins many, many times before it makes it psychologically that much easier to do it again. But there is still work to do before I can physically achieve the target.